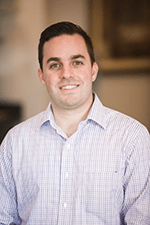 Dr. Christopher Lacerenza joined CT ENT Sinus Center Hearing & Balance as a board certified Nurse Practitioner in 2018. He graduated from Fairfield University with a Bachelor of Science in Nursing from the Marion Peckham Egan School of Nursing and Health Studies. He recently earned his Doctor of Nursing Practice from Fairfield University, graduating with honors. Dr. Lacerenza attained board certification through the American Nurses Credentialing Center (ANCC). While pursuing his Nurse Practitioner degree, Dr. Lacerenza trained directly under Dr. Robert Weiss, focusing on the various aspects of care related to the ENT patient. Throughout his nursing career, he has spent time in the Emergency Department and Urgent Care settings including St. Vincent’s Medical Center and Stamford Hospital, as well as institutions in Westchester, New York. Dr. Lacerenza holds professional certifications in Pediatric Advanced Life Support, Advanced Cardiac Life Support and Basic Life Support for Healthcare Providers. He is also a standing member of the Sigma Theta Tau International Nursing Honor Society, Mu Chi Chapter. Outside of work, Dr. Lacerenza enjoys traveling, playing golf and trying new restaurants.